Good rugby kicking can be vital. Learn and practice these special kicks for different situations. When you kick well in rugby you're a key player. Before you can achieve anything in a game you must be good at controlling the ball. Handle well and it's likely you will kick well. Put the ball in the right place so your foot strikes it correctly and your kicks will be accurate. Be sure you develop both skills at the same time. Best start at rugby kicking basics. 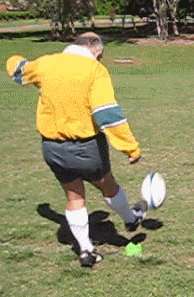 There are a number of different kicks in rugby, used for various reasons in different circumstances. You kick with various objectives in mind. Often your rugby kicking is to gain ground. You can do this with a long kick into unoccupied space on the field or with a kick for touch. In both these cases a spiral punt would do the trick. When you make the kick you release the ball from your hands and kick the ball before it touches the floor. Some call it "kicking out of hand". You place the ball at an angle and kick the ball so that spin is applied. Find out exactly how to do a spiral punt. If you "find touch" (kick the ball out of play across the touch line) play is restarted with a lineout. Several factors determine where the lineout takes place. 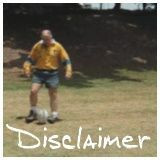 Find more about this where the 22 metre line is explained on the rugby field page. 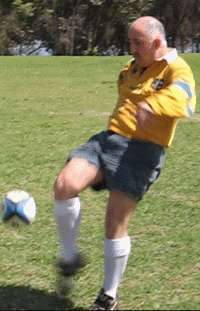 The ball is kicked often in rugby, probably too often. When you catch, pass and run with the ball you control the ball. When you kick the ball you lose control. 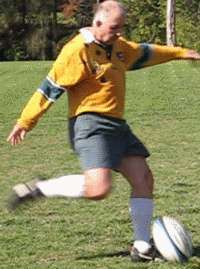 Rugby kicking sends the ball into a grey area where neither team has control. If you must kick, make it difficult for the opposition. Your team then has the best possible opportunity and may re-gain possession. One way of doing this with rugby kicking is to kick the ball high. You will usually gain ground and give team-mates time to run and be under the ball when it returns to ground level. You give your side the opportunity to get the ball back. Find out how to kick the ball high, exactly how to do an up and under. You use this kick to move the ball over defenders instead of carrying the ball through their defensive line. This short kick is perhaps in the 10 - 25 metre range. Find out exactly how you do a chip kick. These kicks travel close to the ground and are difficult for defenders to stop. 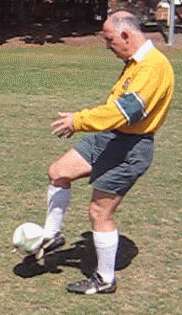 You put low kicks through defensive lines as an alternative to carrying the ball. Find out how you do the kicks known as grubber kicks. This is a special kick for special circumstances. It must touch the ground before you kick it. When you perform this kick you drop the ball to the ground on one of the pointed ends. After the ball strikes the ground and starts to rise you kick it. 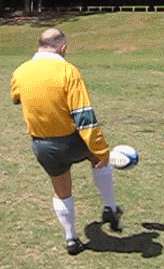 This kick is used for starting and restarting the game and in some circumstances for attempting to convert tries. You can kick so as to maximise height gained so you allow your players more time to get to the ball. You can also kick them to maximise distance so you gain as much ground as possible and move the ball away from dangerous defensive situations. Find out just exactly how to do this, the drop kick . This is a kick you can use to score points for your team. You aim to kick it over the cross bar of the goal posts. 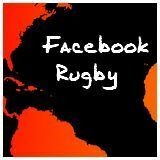 You use this kick for attempting to convert tries and when you`ve been awarded a penalty and decide to kick for goal. Two major styles are used for these kicks. Whichever method of kicking you use, you place the ball so it is pointing towards the posts. It may be upright or sloping. You then take several steps backwards. You then walk or run towards the ball and kick it with the aim of getting it both between the uprights and over the cross-bar of the posts. Successful kicks are rewarded, you gain points for the team. Find out exactly how to take a place kick.